Jonathon Willis at the Edmonton Journal has an article about Lauri Korpikoski's complete inability to play NHL hockey. Behind them, all by himself, is Korpikoski. When Korpiksoki takes the ice, the opposition manages to out-attempt the Oilers 62-38. Only two other forwards in the entire NHL (min. 100 minutes played) can claim a worse on-ice number than that. All the other shot metrics, from Fenwick to scoring chances, are similarly skewed. Individual contributions to scoring chances say the same thing; Korpikoski has easily the worst numbers of any regular Oilers winger. The numbers for high-danger chances are most damning of all; Edmonton is out-chanced by a 70-30 margin when Korpikoski is on the ice. That’s worse than even Steve MacIntyre managed during either of his two 20-plus game seasons as an Oiler. Unlike MacIntyre, Korpikoski is not an enforcer. He’s not taking on tough opponents; he’s not even being asked to take on a particularly ridiculous diet of defensive zone starts. It’s been more than a month since he’s contributed an even-strength point. He has no particular value to the Oilers and has been a millstone around the neck of whichever forward line he’s been assigned to. Billed as a forward who can contribute on both sides of the puck, all too often he’s contributed on neither. One of the ripple effects of Gordon’s departure was the signing of centre Mark Letestu to a three-year deal, which in the early going isn’t looking like a terribly wise investment either. It’s possible, had Chiarelli not made the deal, that Edmonton would have neither Korpikoski nor Letestu on the payroll and would be looking now at dealing Gordon for a late draft pick at the trade deadline. That would look fairly appealing right now, though it's worth noting that the same butterfly effect that resulted in Mark Letestu (who played very well against Boston but only does that every 20 games or so) also would have left the Oilers a different team. Boyd Gordon has been pretty disappointing on a relatively strong Arizona team so far this season [I like how now we're partially ignoring the butterfly effect. -ed] netting only 2 points in 24 games. He wouldn't even be on their roster right now if the team wasn't impressed by his work in faceoffs which has fallen off considerably since early November: he's now 39th in the league barely ahead of Shawn Horcoff and well behind the aforementioned Mark LaTestTube. So maybe swapping Gordon for Letestu (who has 7 points, but a worse +/-) would help the team, maybe it wouldn't. Of course, without the trade the difference isn't Gordon vs. Letestu but (Gordon + ???) vs. (Lestestu + Korpikoski). Who would be the (???)? I guess the question can be answered by looking at the Oilers roster before the Gordon-Lestestu trade. Fortunately, I was looking at the question of the Oilers roster spots back in June and debated how to fill the various holes. Of course, a few caveats are needed here. First off, notice that my roster assumes everybody has been uninjured all season. McDavid, Klinkhammer, and Yakupov are all currently injured and my post doesn't have a "solution" on how to fill those missing parts of the roster. Secondly, remember that this created less than a week after the Stanley Cup had been awarded and posted over a month later, and therefore the roster holes weren't filled in the manner in which I prescribed. Finally, Draisaitl on the fourth line? McDavid and Yakupov broken up?† Whoops! Like the boys in the front office, hindsight makes some of my predictions look foolish too. So would Gordon have played better in Edmonton with Pouliot and Yakupov on his line? Once Yak and McDavid were paired up would Gordon have played better with Pouliot and Slepyshev on his line? Hendricks? Or one of the roster holes I advise they fix and didn't? It's hard to say. You end up with the "NFL million mile yard" problem. Also, would the Oilers have kept Gordon and then instead somehow traded for Korpikoski anyways? The what-if scenarios can lead you down the rabbit hole sometimes, and sometimes that's fair and other times its an exercise in madness. The third worst Corsi forward in the league (who logged 15 minutes of ice time against the Bruins, and another 15 minutes of ice team against the Leafs)? I think there's an exercise in madness here and it isn't from the analysis. Willis makes the most damning attack imaginable to close out his column. Even with all of those players out of the lineup, on merit he should probably be taking a seat to allow Luke Gazdic to return to game action. † In all fairness the professional folks in the Oilers organization -- unlike me -- didn't have Draisaitl or Nurse on the big squad to start the year either. 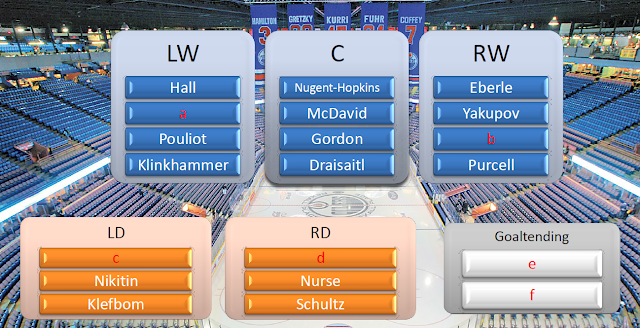 Nurse has progressed decently as a defenseman, but obviously Draisaitl is a breakout player. He doesn't belong on the fourth line where I stuck him, he definitely doesn't belong on the fifth line where Chiarelli put him. The same Chiarelli had #OilersFistCaptain on the team too, which I didn't and never ever will.